For most of us, spring and early summer bring about images of gobbling turkeys, crappie fishing, baseball games, colorful landscapes, barbecues, and emerging crops. But, very few of us relate this time of year to honeybee swarm season. 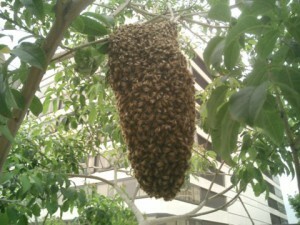 I would even bet that most of us have never witnessed a honeybee swarm in flight or clumped up dangling from a branch. For this very reason, it is a fascinating and mysterious phenomenon. The sight of swarming bees can certainly cause nightmares for some people. However, it is a very natural behavior that honeybees exhibit during late spring and early summer. Swarming is nature’s way of propagating the species. With the recent decline in commercial colonies, scientist and beekeepers alike, suggest allowing a beekeeper to capture swarms that you encounter. A honey bee colony declines in numbers throughout the winter as its food stores are depleted. Now, there are far fewer bees in the colony than there were in the summer. The colony will likely have a queen, 15-20 thousand worker bees, and no drones (they get the boot in the fall to conserve food resources). At this point in late winter the bees will be huddled around remaining food stores to keep warm. As the days get longer and the temperatures warm, the colony expands. The queen is busy laying eggs to produce more workers and eventually drones. The colony is extremely efficient and may have 50-80 thousand workers foraging, building comb, regulating hive temperature, guarding the colony, tending to brood or feeding the queen. This entire process is communicated through pheromones and this is very important to remember when understanding the swarming process. The queen honey bee produces a pheromone that attracts the workers to her. This pheromone also directs the workers to build comb, forage, and tend the brood. The queen communicates to the colony by dancing too. The colony is very aware that it needs a viable queen for its continued survival and that her role in the colony is important. So, the colony is working hard and the queen is busy laying to produce more workers. Now there are thousands upon thousands of workers and the colony is becoming crowed. So crowded in fact, that many of the workers cannot sense the presence of the queen. This triggers the swarming tendency and the workers begin raising a new queen. Like in most households, there is no room for more than one queen! So, prior to the new queens emergence, the old queen swarms – taking with her between one-third and one-half of the colony. Before leaving to establish a new hive, the bees gorge themselves on nectar. You might witness this as a whirling swarm of bees flying across the landscape or as a swarm settled on a bush or branch. I personally have seen them settle on swing sets, fence posts, propane tanks, patio furniture, and corn stalks. The clumping occurs from the workers gathering around the queen (remember they are attracted to her pheromone). For one, they are protecting her because she is vital to their survival. And two, they are feeding her with the nectar they gorged on before swarming. Because the queen is not the strongest of flyers, they must stop at some point and rest. While they are resting, scout bees are sent out to look for a suitable location for the colony to live. Swarms will not usually rest in a location for very long. I have seen them rest in a clump for just a few minutes up to a couple of days. They generally move on once they have located a new dwelling to occupy. Swarms are not dangerous. While swarming, bees are focused on finding a new home and surviving, not attacking. They are vulnerable and do not have a home or brood to protect. But keep in mind, it is important to keep your distance from swarming bees, because if they feel threatened it is possible they will sting. Keep your distance and please do not attempt to move or destroy them. Leave them alone and allow them to move on. Go to: Mississippi Beekeepers – Bees-On-The-Net or use the link www.bees-on-the-net.com/mississippi-swarm-removal/ to find local beekeepers near you. The first step in having a successful vegetable garden is proper site selection. Three main things to consider when deciding where to locate your vegetable garden is whether or not plants will have access to sunlight, fertile soil and water. Most vegetables need at least six hours of full or direct sunlight per day for optimum growth. Obviously, you want to avoid areas such as next to large trees and buildings that could block needed sunlight from plants causing future issues. Another requirement for producing an abundance of fresh vegetables is good soil. If the soil is hard, rocky, soggy, or nutrient-poor, the vegetables will be, too. In general, vegetable garden soil should be well draining and loose with plenty of organic matter. Poorly drained, fine textured soils such as clay or soils that are too coarse like sand are not ideal. 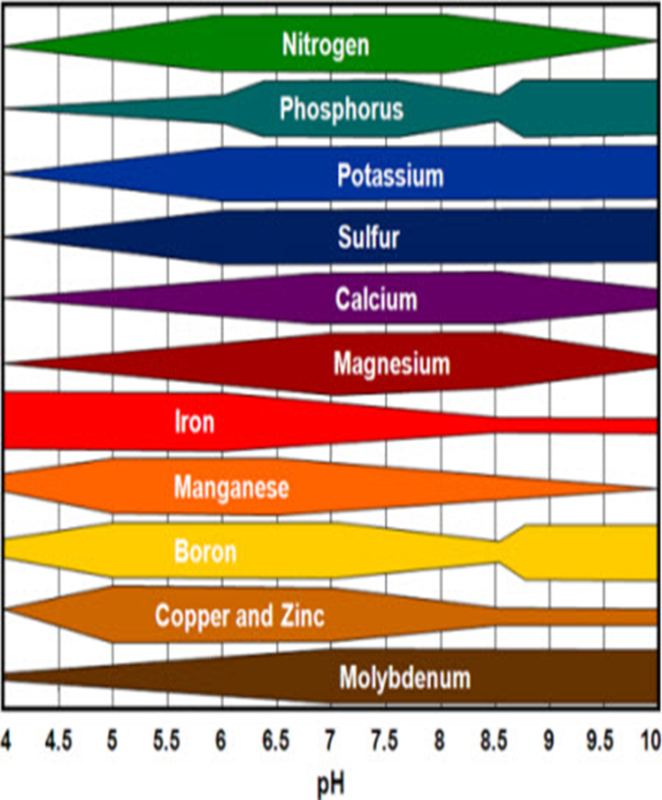 A soil with a high clay content will drain slowly, having the potential to cut off the oxygen supply to plants roots. On the other hand, if the soil is too sandy it may drain too quickly before plants are able to take up the proper amount of much needed water. 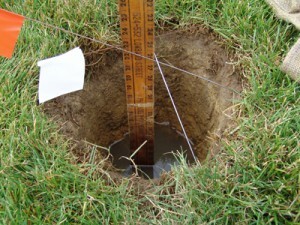 If you have a large coffee can you can check the drainage of your new garden site by demonstrating a percolation test. Dig a 4 inch hole that is wide enough for the can and cutting out the bottom of the can. Firmly place the can in the hole so that nothing can escape around the outside edges of the bottom. Fill the can up and watch the water level for an hour. If less than 2 inches drains you have a poorly draining location and 5 or more inches drains then your soil drains a bit too quick. If you don’t have a coffee can you can still dig the hole and fill it with water just bear in mind that some of the water will travel laterally in the soil. Even though a heavy clay soil like most of our soils here in the delta may be less than ideal for growing vegetables, practicing proper management strategies can help make these soils more optimum. Increasing the organic matter content of a clay soil makes it easier to work, and improves the internal drainage. Increasing the soil’s organic matter content can be done by adding manure, composted leaves, sawdust, bark, etc. 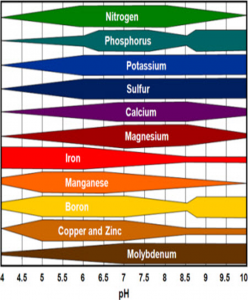 Since pH and fertilizer needs vary by type of vegetable, it is important to have your soil tested to help you make the proper adjustments. Last but definitely not least, your vegetable garden should be located close to a water source. Whether it be in row crop situation, home horticulture or vegetable gardening, water usually the most limiting factor effecting yield. Vegetable gardens usually use about 1 – 2 inches of water per week during the growing season. Locating your garden near a water source gives you few excuses for letting the garden stress during the heat of summer or in dry weather conditions. Adequate soil moisture is important for seed germination, uniform growth, and productivity. Easy access to a garden hose means less lugging-around of watering cans, and it also helps if you decide to install soaker hoses or a drip irrigation system. 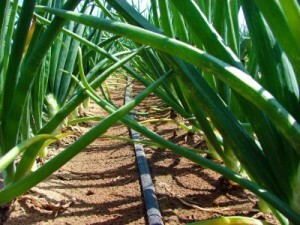 Onions irrigated by drip irrigation. Other factors to consider is how much produce will be needed to fulfill the needs of family and friends. Places that have been overlooked could have potential weed problems in the future. Try to steer clear from locations with morningglory, nutsedge, and bermudagrass. Also don’t forget to flag off or fence in a site to keep pets and children from playing in the garden. If there is a wildlife that frequents the area, the use of an electric fence could be the best option. Don’t hesitate to contact your local county extension office and ask questions or advice. Last updated May 19th, 2016. Technical problems, contact support.